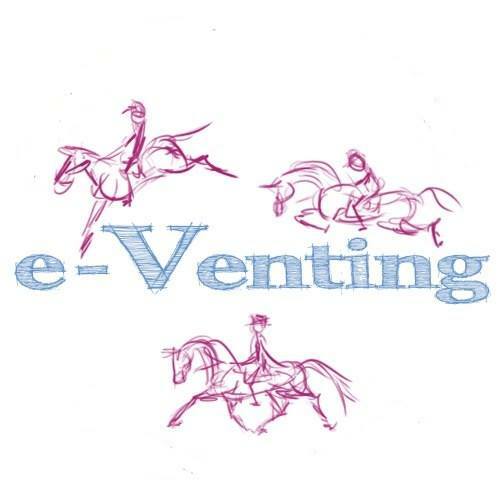 which was brought to our notice on Twitter by the ‘Eventing Consultant’ (who can be relied on for entertaining tweets, and has the inside line on Team Ireland there) follows Camilla Spiers to her ‘room’ (I’m not sure that’s the correct word for it, not a lot of room in there at all) and shows just how claustrophobic it is. 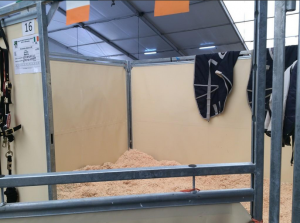 Photo of 1 of the Irish Team’s stables. They look as if they are the typical size for International events. While most riders probably choose to stay in a local hotel if possible, or perhaps in their palatial double-pop-out Oakleys, some have hitched a lift there, usually with a fellow Team Member following Training Camp, and the general rule if you do that is that you sleep in the horse area on a put-up bed (not particularly restful or warm, a good night’s sleep definitely not guaranteed!) or find your own accommodation, rather than overfilling the already cramped living area (where rider, possibly family, groom, and so on are already staying) with extra bodies. 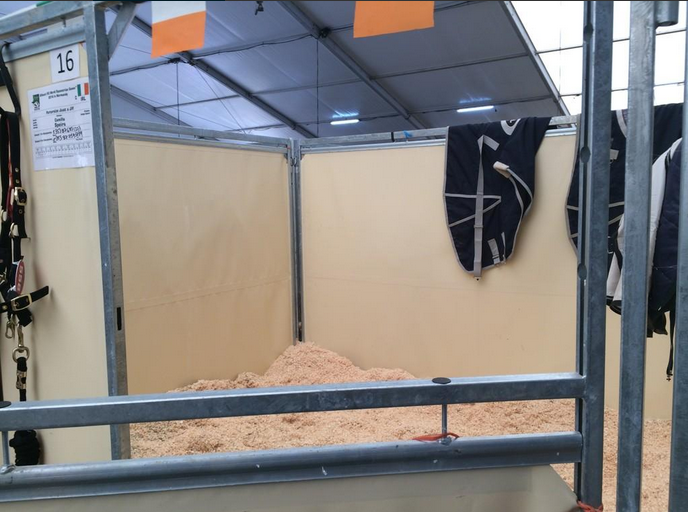 From this video we think that the horses’ stables have probably got about twice the floorspace that the riders have been allocated. Riders of over 6′ might be struggling a bit with the length of the beds, too! Plus, anyone claustrophobic (or who isn’t colourblind) might be found wandering around the lorry park, gibbering with fear. Is this a sneaky French tactic to banjax some of the opposition? 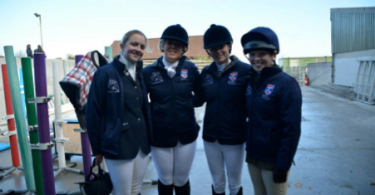 Photo kindly supplied by ‘Eventing Consultant’ on Twitter, and used with permission. Not seen enough footage of #MMBHT 2014 yet?